Dear graduates: None of you is special. Illustration by Alex Eben Meyer. McCullough’s suggestion is that their confidence, their carefully bolstered self-esteem, might be unearned. He argues that they are operating under a false impression of their own centrality and vividness. (As he puts it, “hundreds gasp at delight with your every tweet.”) The speech could be read as very practical, useful advice for these students, an explicit, tough love exhortation to do something interesting, unusual, extraordinary, not just to think they are interesting, unusual, extraordinary. But it could also be read as a statement of finely wrought contempt. The temptation to tell the gathered students—all dressed up under their graduation gowns, in the heat, the smell of fresh mown grass, the watercolor-blue sky, celebratory cakes in boxes on counters at home—something they are not expecting must be hard to resist for a certain kind of charismatic, boundary-breaking educator or writer or other distinguished person. There is rarely such a rich, glimmering possibility for upending platitudes and an audience so primed, so emotionally wrought, so unusually open to listening, so uncharacteristically reflective. 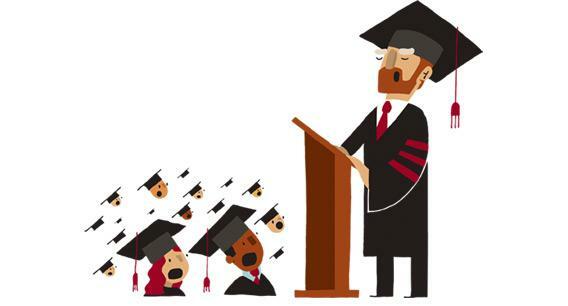 At my own graduation, the headmistress of my girls’ school gave an overtly hostile graduation speech enumerating in startling detail how difficult, theatrical, and irritatingly self-righteous the graduating class was. The rows of girls in white dresses felt extremely betrayed, along with their parents. She singled out the hypocrisy of a piece I had written for our underground newspaper, Samizdat, called “The Mystique of the Ivies” about how the school was pressuring students to go to Ivy League colleges, even though I myself, along with many of the other editors of this pretentiously subversive publication, was headed to an Ivy league college in the fall. She attacked us for our half-informed, rather-festive sit-in in the lobby against the school’s investment in South Africa. Sometime later she stepped down from her position and left the school. * It was widely believed that she had suffered some form of nervous collapse: The bracing originality of her act or performance piece was not appreciated, in part because she lacked the panache of McCullough, if not the simmeringly channeled rage. Michael Lewis’ recent charming, and mildly subversive, commencement speech at Princeton attributed his professional success to luck, specifically being seated next to the wife of someone who worked at Salomon Bros., at a dinner in his 20s. He then went on to discuss a psychological study about how people who were randomly assigned “leaders” in a group felt they were entitled to an extra cookie. In the most tactful way possible, he suggested to the gathered Princeton graduates that they had that extra cookie but should understand very clearly that they don’t deserve it.